Brad Johansen left WKRC-TV after February sweeps last year. Former WKRC-TV news anchor Brad Johanson is gone from WRAL-TV in Raleigh, N.C., after one year. "There was a personnel matter and we handled it immediately," said Joel Davis, WRAL-TV general manager, in an email to the News & Observer. "Brad Johansen is no longer with the station." The announcement was made to the staff earlier Thursday. After nearly 26 years at WKRC-TV, Johansen left Channel 12 in February last year. The day of Christmas 2017, the North Carolina station announced that Johansen would join the news team April 2, 2018. Johansen broke the story about Lauren Hill wanting to play college basketball while battling cancer in October 2014. WRAL-TV needed a No. 1 anchorman to replace David Crabtree, who was planning on retiring after 35 years at the end of 2018. However, the News & Observer said Crabtree announced last November that he would postpone retirement for another two years. In Cincinnati, the No. 1 anchor job was out of reach for Johansen at WKRC-TV as long as second-generation broadcaster Rob Braun was on the payroll. When Johansen's move was made public in late 2017, he said that he was going to "journalism heaven" in Raleigh, and to "basketball heaven," referring to the University of North Carolina, North Carolina State and Duke. "I'm just going to come in and do whatever they ask me to do. Hopefully I'll do a lot of storytelling, and I'll fill in on the anchor desk when needed," Johansen told me. As his Channel 12 contract was expiring in August of 2017, Johansen said he "got a phone call that they (WRAL-TV) were doing a search (for an anchor)." He got a six-month extension for WKRC-TV through Feb. 28 last year, his last day before going to the Raleigh-Durham TV market. Johansen came to Channel 12 in 1992 to anchor the city's first Saturday morning local newscast. He transitioned to sports director when Ken Broo left WKRC-TV in 1996, and did play-by-play for Fox Sports Ohio, CBS and CBS Sports Network. 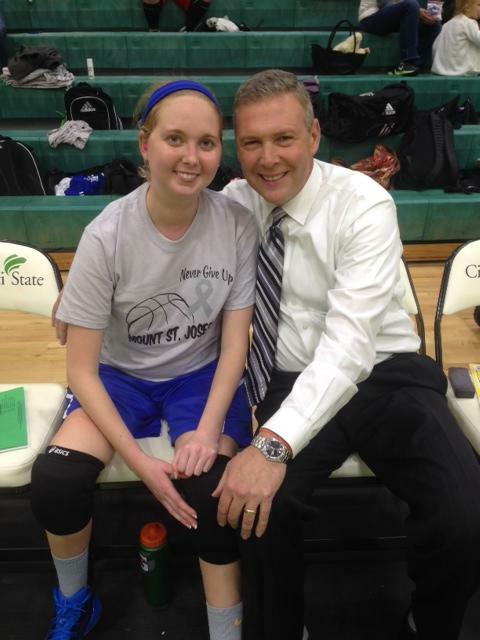 Channel 12 managers forced him to go back to news anchor in fall 2014, and a month later he broke the story about Lauren Hill, the young college basketball player battling cancer. He and his family lived in Mason, where his wife Colleen taught in Mason schools. Brad and Colleen also raised more than $2 million for charities through their golf outing and 12 years of "Party for a Purpose." "I arrived in Cincinnati in 1992. I planned on staying for two years. Twenty-six years later it’s time to go. WKRC became home to me. I owe so much to this station, and more importantly to the people who watched this station. Viewers have invited me into their homes for more than a quarter-century, and they passionately shared with me how much they care ... This is a special place. I’m leaving, but I won’t ever be completely gone ... Thank you Cincinnati. I owe you." On this date: Cincinnati's second television station, WKRC-TV, debuted as Channel 11 on April 4, 1949. It moved to Channel 12 on Oct. 20, 1952 as part of the nationwide TV frequency realignment. The Taft family owned the station, and until 1960 it broadcast from the Tafts' Cincinnati Times-Star evening newspaper office at 800 Broadway downtown. That's where Rod Serling did his first TV drama, The Storm, and comedian Soupy Sales (known here as Soupy Hines) did his show in the early 1950s. Monday, Feb. 26 update: Brad Johansen's last day at WKRC-TV is Wednesday, Feb. 28. See my new post today, "Brad Johansen's Top 12 Moments At Channel 12." 10:30 a.m. Thursday Dec. 28 update: Why is Brad Johansen leaving WKRC-TV after 26 years? He's going to "journalism heaven" and "basketball heaven" at WRAL-TV in Raleigh, N.C., near the University of North Carolina, North Carolina State and Duke. But the decision wasn't easy. Before Brad Johansen leaves WKRC-TV Wednesday, Feb. 28, and heads to WRAL-TV in Raleigh, N.C., I asked him to tell me his favorite moments, experiences and people from 26 years in Cincinnati at Channel 12. "I arrived in Cincinnati in 1992. I planned on staying for two years," he tells me. "WKRC became home to me. I owe so much to this station, and more importantly to the people who watched this station…. This is a special place. Thank you Cincinnati. I owe you."